Rouselle Lavado was a Post-Graduate Fellow in the 2011 cohort at IHME and a Senior Research Fellow at the Philippine Institute for Development Studies. At IHME, she was part of the Health Financing research team, developing methods to estimate expenditures by disease. 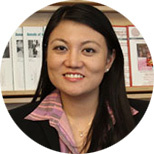 After her time at IHME, Dr. Lavado went on to work as a Health Economist at the World Bank. Lavado RF, Brooks BP, Hanlon M. Estimating health expenditure shares from household surveys. Bulletin of the World Health Organization. 2013 Jul 1: 91(7): 519-524C. doi: 10.2471/BLT.12.115535. Epub 2013 May 31.